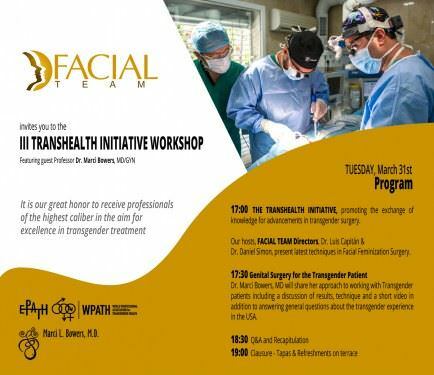 It is our pleasure to announce the 3rd TransHealth Initiative Workshop, hosted by FACIALTEAM in Marbella. The free workshop series is an ongoing effort to bring together health professionals in transgender care for a common purpose: innovation and advancement in services aimed at improving the quality of life for members of the transgender community. FACIALTEAM´s directing role in this project is to raise awareness about modern approaches to facial feminization within the healthcare sector, therefore increasing visibility of the the needs of transgender women in the LGBT sector. The initiative is proud to have organized two workshops in the inaugural year 2014: Firstly with cofounder of the initiative, Dr. Preecha of Thailand, along with representatives of the Okayama Gender Unit of Japan (focused on Gender Confirmation Surgery) and secondly with Dr. Esben Esther Benestad of Norway to discuss FFS in relation to sexology. In addition and most recently, in combination with Jenny Bowman of THE HIDDEN WOMAN, a staff training session was organized, “Understanding your Transgender Patients” with the personnel of our base hospital, HC International Hospital. To our great excitement, invited guest Dr. Marci Bowers of California will next share her vast expertise in genital surgery for any interested professionals or patients. The capacity is limited to 8 attendees, so please be sure to register for this workshop soon!